A birthday is a special occasion for everyone. A Rose is the perfect gift to charm your loved ones on the special day. The layers of beautiful petals make them more lovable. 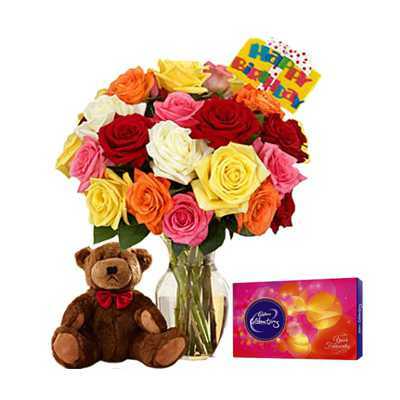 This exclusive assortment of delicious chocolate pack, a cute 6 inch teddy and 24 colorful Roses will make for the perfect gift for your loved ones. I ordered this bunch of flowers for my Wife's Bday and as expected, the flowers were fresh but chocolates disappointed me as it was Cadbury's Fruit n Nut and not the imported ones.